Lush make some amazing products, but this little puppy has helped see my poor lips through the past few months after being ravaged by winter. 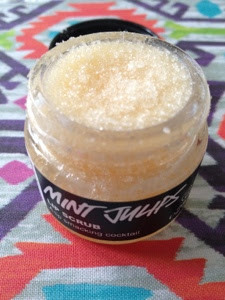 Mint Julips is a sugar based lip scrub that smells like minty chocolate (yum). You rub a small amount into dry lips to exfoliate and then either wash or lick off (it's completely edible!). I normally use this just before bed and slather on a load of lip balm and wake up with super soft lips. As well as the mint chocolate flavour, they also sell bubblegum and popcorn, which both smell divine. The pots sell for £5.25, which isn't cheap, but they will last for ages. I've used my every few days for a month and have barely scratched the surface. When it finally runs out, I will definitely be repurchasing! 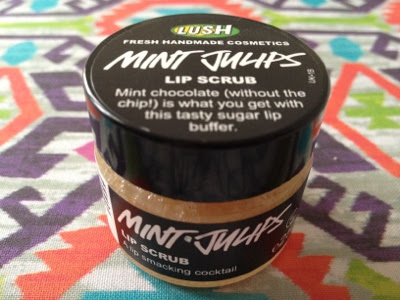 Have you tried any of these lip scrubs from Lush? I've never tried a lip scrub before but really should (I'm naughty and always end up picking my lips!) - this lush one looks lovely! I can't remember how my lips survived before I bought my Lush lip scrub! I've had mine for nearly a year now and I've barely used any, and I use it every day!